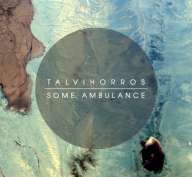 Talvihorros is Ben Chatwin, an experimental composer from London, exploring the possibilities of the guitar. His compositions venture into the fields of ambient, modern classical, drone, post-rock and folk but dont fall into the cliches associated with any of these genres. I think Black Dice on what was one of their first UK shows in a cinema in Brighton. I dont think i’ve found it yet.